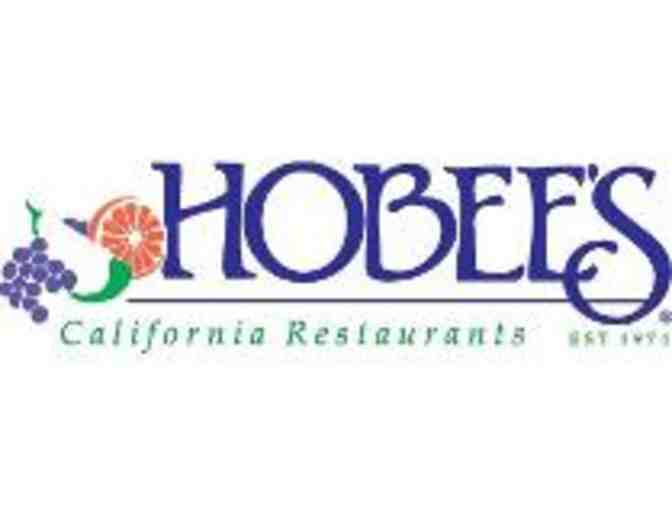 You are bidding on a $25 Gift Card to Hobees California Restaurants. Hobee's has satisfied thousands of healthy appetites with fresh, distinctive cuisine since 1974, when the first restaurant opened in Mountain View, California. Today, Hobee's is an award-winning phenomenon boasting nine popular locations throughout northern California. Hobee's customers enjoy fast and friendly service in a casual, homey atmosphere. We offer generous portions at modest prices and are conveniently open for breakfast, lunch and dinner (except at Mountain View, Montague Expressway and Redwood Shores, where we serve breakfast and lunch exclusively). The restaurants cater to a delightfully diverse clientele: students, businesspersons (including the who's who of Silicon Valley high-tech) seniors and celebrities all feel warmly welome at Hobee's. And we back up our motto that "kids are cool at Hobee's" by providing extras - like a special children's menu and custom-designed coloring sheets - to our tiniest patrons. Hobees is proud to introduce a new gluten-free menu, too. You may use this card at these locations: Mountain View, Palo Alto, Redwood Shores, San Jose, Sunnyvale. Free shipping of gift certificate via USPS or local pickup at WSP.